For the American band, see Aorta (band). Right and left coronary arteries. The aorta (/eɪˈɔːrtə/ ay-OR-tə) is the main and largest artery in the human body, originating from the left ventricle of the heart and extending down to the abdomen, where it splits into two smaller arteries (the common iliac arteries). The aorta distributes oxygenated blood to all parts of the body through the systemic circulation. Course of the aorta in the thorax (anterior view), starting posterior to the main pulmonary artery, then anterior to the right pulmonary arteries, the trachea and the esophagus, then turning posteriorly to course dorsally to these structures. In anatomical sources, the aorta is usually divided into sections. One way of classifying a part of the aorta is by anatomical compartment, where the thoracic aorta (or thoracic portion of the aorta) runs from the heart to the diaphragm. The aorta then continues downward as the abdominal aorta (or abdominal portion of the aorta) diaphragm to the aortic bifurcation. The aortic arch loops over the left pulmonary artery and the bifurcation of the pulmonary trunk, to which it remains connected by the ligamentum arteriosum, a remnant of the fetal circulation that is obliterated a few days after birth. In addition to these blood vessels, the aortic arch crosses the left main bronchus. Between the aortic arch and the pulmonary trunk is a network of autonomic nerve fibers, the cardiac plexus or aortic plexus. The left vagus nerve, which passes anterior to the aortic arch, gives off a major branch, the recurrent laryngeal nerve, which loops under the aortic arch just lateral to the ligamentum arteriosum. It then runs back to the neck. The aortic arch has three major branches: from proximal to distal, they are the brachiocephalic trunk, the left common carotid artery, and the left subclavian artery. The brachiocephalic trunk supplies the right side of the head and neck as well as the right arm and chest wall, while the latter two together supply the left side of the same regions. The ascending aorta develops from the outflow tract which initially starts as a single tube connecting the heart with the aortic arches (which will form the great arteries) in early development, but then is separated into the aorta and the pulmonary trunk. The aortic arches start as five pairs of symmetrical arteries connecting the heart with the dorsal aorta, and then undergo a significant remodelling to form the final asymmetrical structure of the great arteries, with the 3rd pair of arteries contributing to the common carotids, the right 4th forming the base and middle part of the right subclavian artery and the left 4th being the central part of the aortic arch. The smooth muscle of the great arteries and the population of cells that form the aorticopulmonary septum that separates the aorta and pulmonary artery is derived from cardiac neural crest. This contribution of the neural crest to the great artery smooth muscle is unusual as most smooth muscle is derived from mesoderm. In fact the smooth muscle within the abdominal aorta is derived from mesoderm, and the coronary arteries, which arise just above the semilunar valves, possess smooth muscle of mesodermal origin. A failure of the aorticopulmonary septum to divide the great vessels results in persistent truncus arteriosus. 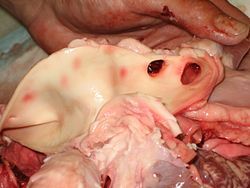 A pig's aorta cut open, also showing some branching arteries. The aorta is an elastic artery, and as such is quite distensible. The aorta consists of a heterogeneous mixture of smooth muscle, nerves, intimal cells, endothelial cells, fibroblast-like cells, and a complex extracellular matrix. The vascular wall consists of several layers known as the tunica externa, tunica media, and tunica intima. The thickness of the aorta requires an extensive network of tiny blood vessels called vasa vasorum, which feed the tunica externa and tunica media outer layers of the aorta. The aortic arch contains baroreceptors and chemoreceptors that relay information concerning blood pressure and blood pH and carbon dioxide levels to the medulla oblongata of the brain. This information is processed by the brain and the autonomic nervous system mediates the homeostatic responses. Within the tunica media, smooth muscle and the extracellular matrix are quantitatively the largest components of the aortic vascular wall. The fundamental unit of the aorta is the elastic lamella, which consists of smooth muscle and elastic matrix. The medial layer of the aorta consist of concentric musculoelastic layers (the elastic lamella) in mammals. The smooth muscle component does not dramatically alter the diameter of the aorta but rather serves to increase the stiffness and viscoelasticity of the aortic wall when activated. The elastic matrix dominates the biomechanical properties of the aorta. The elastic matrix forms lamellae, consisting of elastic fibers, collagens (predominately type III), proteoglycans, and glycoaminoglycans. In patent ductus arteriosus, a congenital disorder, the fetal ductus arteriosis fails to close, leaving an open vessel connecting the pulmonary artery to the proximal descending aorta. The aorta supplies all of the systemic circulation, which means that the entire body, except for the respiratory zone of the lung, receives its blood from the aorta. Broadly speaking, branches from the ascending aorta supply the heart; branches from the aortic arch supply the head, neck and arms; branches from the thoracic descending aorta supply the chest (excluding the heart and the respiratory zone of the lung); and branches from the abdominal aorta supply the abdomen. The pelvis and legs get their blood from the common iliac arteries. The pulsatile nature of blood flow creates a pulse wave that is propagated down the arterial tree, and at bifurcations reflected waves rebound to return to semilunar valves and the origin of the aorta. These return waves create the dicrotic notch displayed in the aortic pressure curve during the cardiac cycle as these reflected waves push on the aortic semilunar valve. With age, the aorta stiffens such that the pulse wave is propagated faster and reflected waves return to the heart faster before the semilunar valve closes, which raises the blood pressure. The stiffness of the aorta is associated with a number of diseases and pathologies, and noninvasive measures of the pulse wave velocity are an independent indicator of hypertension. Measuring the pulse wave velocity (invasively and non-invasively) is a means of determining arterial stiffness. Maximum aortic velocity may be noted as Vmax or less commonly as AoVmax. Mean arterial pressure (MAP) is highest in the aorta and the MAP decreases across the circulation from aorta to arteries to arterioles to capillaries to veins back to atrium. The difference between aortic and right atrial pressure accounts for blood flow in the circulation. When the left ventricle contracts to force blood into the aorta, the aorta expands. This stretching gives the potential energy that will help maintain blood pressure during diastole, as during this time the aorta contracts passively. This Windkessel effect of the great elastic arteries has important biomechanical implications. The elastic recoil helps conserve the energy from the pumping heart and smooth out the pulsatile nature created by the heart. Aortic pressure is highest at the aorta and becomes less pulsatile and lower pressure as blood vessels divide into arteries, arterioles, and capillaries such that flow is slow and smooth for gases and nutrient exchange. All amniotes have a broadly similar arrangement to that of humans, albeit with a number of individual variations. 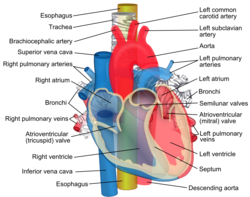 In fish, however, there are two separate vessels referred to as aortas. The ventral aorta carries de-oxygenated blood from the heart to the gills; part of this vessel forms the ascending aorta in tetrapods (the remainder forms the pulmonary artery). A second, dorsal aorta carries oxygenated blood from the gills to the rest of the body, and is homologous with the descending aorta of tetrapods. The two aortas are connected by a number of vessels, one passing through each of the gills. Amphibians also retain the fifth connecting vessel, so that the aorta has two parallel arches. 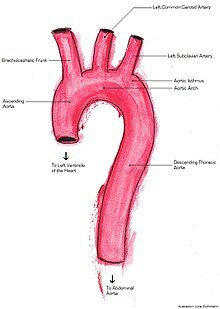 The word 'Aorta' stems from the Late Latin aorta from Classical Greek aortē (ἀορτή), from aeirō, "I lift, raise" (ἀείρω) This term was first applied by Aristotle when describing the aorta and describes accurately how it seems to be 'suspended' above the heart. The function of the aorta has been documented in the Talmud, where it is noted as one of three major vessels entering or leaving the heart, and where perforation is linked to death. ^ Maton, Anthea; Jean Hopkins; Charles William McLaughlin; Susan Johnson; Maryanna Quon Warner; David LaHart; Jill D. Wright (1995). Human Biology Health. Englewood Cliffs, New Jersey: Prentice Hall. ISBN 978-0-13-981176-0. ^ Tortora, Gerard J. (1995). Principles of Human Anatomy (Seventh ed.). Harper Collins. pp. 341, 367, 369. ISBN 978-0-673-99075-4. ^ Tortora, Gerard J.; Grabowski, Sandra Reynolds (1996). Principles of Anatomy and Physiology (Eighth ed.). Harper Collins. p. 634. ISBN 978-0-673-99355-7. ^ Hole, John W. Jr.; Koos, Karen A. (1994). Human Anatomy (Second ed.). Wm. C. Brown. p. 479. ISBN 978-0-697-12252-0. ^ De Graaff, Van (1998). Human Anatomy (Fifth ed.). WCB McGraw-Hill. pp. 548–549. ISBN 978-0-697-28413-6. ^ Putz, R.; Pabst, R., eds. (2006). Atlas van de menselijke anatomie (Translated from German (Atlas der Anatomie des Menschen)) (in Dutch) (3rd ed.). Bohn Stafleu van Loghum. ISBN 978-90-313-4712-4. ^ a b c Drake, Richard L.; Vogl, Wayn A.; Mitchell, Adam W. M. (2010). Gray's Anatomy for Students (2nd ed.). Churchill Livingstone (Elsevier). ISBN 978-0-443-06952-9. ^ Netter, Frank H. (2003). Atlas of Human Anatomy (3rd ed.). ICON Learning Systems. ISBN 978-1-929007-21-9. ^ a b c d Drake, Richard L.; Vogl, Wayne; Tibbitts, Adam W.M. Mitchell; illustrations by Richard; Richardson, Paul (2005). Gray's anatomy for students. Philadelphia: Elsevier/Churchill Livingstone. ISBN 978-0-8089-2306-0. ^ Lech, C; Swaminathan, A (November 2017). "Abdominal Aortic Emergencies". Emergency Medicine Clinics of North America. 35 (4): 847–67. doi:10.1016/j.emc.2017.07.003. PMID 28987432. ^ Bamforth, Simon D.; Chaudhry, Bill; Bennett, Michael; Wilson, Robert; Mohun, Timothy J.; Van Mierop, Lodewyk H.S. ; Henderson, Deborah J.; Anderson, Robert H. (2013-03-01). "Clarification of the identity of the mammalian fifth pharyngeal arch artery". Clinical Anatomy. 26 (2): 173–182. doi:10.1002/ca.22101. ISSN 1098-2353. PMID 22623372. ^ Ritman, E; Lerman, A (2007). "The dynamic vasa vasorum". Cardiovascular Research. 75 (4): 649–658. doi:10.1016/j.cardiores.2007.06.020. ISSN 0008-6363. PMC 2121590. PMID 17631284. ^ Tsamis, A.; Krawiec, J. T.; Vorp, D. A. (2013). "Elastin and collagen fibre microstructure of the human aorta in ageing and disease: a review". Journal of the Royal Society Interface. 10 (83): 20121004. doi:10.1098/rsif.2012.1004. ISSN 1742-5689. PMC 3645409. PMID 23536538. ^ Seeley, Rod; Stephens, Trent; Philip Tate (1992). "20". In Allen, Deborah (ed.). Anatomy and physiology (2 ed.). Mosby-Year Book, Inc. p. 631. ISBN 978-0-8016-4832-8. ^ Samett EJ. http://www.emedicine.com/radio/topic44.htm Aorta, Trauma. eMedicine.com. Accessed on: April 24, 2007. ^ Tambyraja, A; Scollay, JM; Beard, D; Henry, JM; Murie, JA; Chalmers, RT (2006). "Aortic Trauma in Scotland - A Population Based Study". European Journal of Vascular and Endovascular Surgery. 32 (6): 686–689. doi:10.1016/j.ejvs.2006.04.006. PMID 16750920. ^ Romer, Alfred Sherwood; Parsons, Thomas S. (1977). The Vertebrate Body. Philadelphia, PA: Holt-Saunders International. pp. 419–421. ISBN 978-0-03-910284-5. ^ Illustrated Steadman's Dictionary, 24th ed. ^ Harper, Douglas. "Aorta". Online Etymology Dictionary. Retrieved 5 January 2014. ^ Rosner, Fred (1995). Medicine in the Bible and the Talmud: Selections from classical Jewish sources (Augm. ed.). Hoboken, NJ: KTAV Pub. House. pp. 87–96. ISBN 9780881255065.